Ab (David Abbott) Jenkins was a devout Mormon who did not drink or smoke. He was interested in pushing endurance records beyond what his Mormon Meteor II racer could achieve. The Duesenberg J chassis of the Mormon Meteor II simply could not handle its heavy, 750 hp (559 kW) Curtiss Conqueror V-12 aircraft engine. In 1937, Jenkins commissioned Augie Duesenberg to design a new car able to accommodate the 1,570 cu in (25.7 L) Curtiss Conqueror or an Allison V-1710 engine. The new endurance racer was known as the Mormon Meteor III. 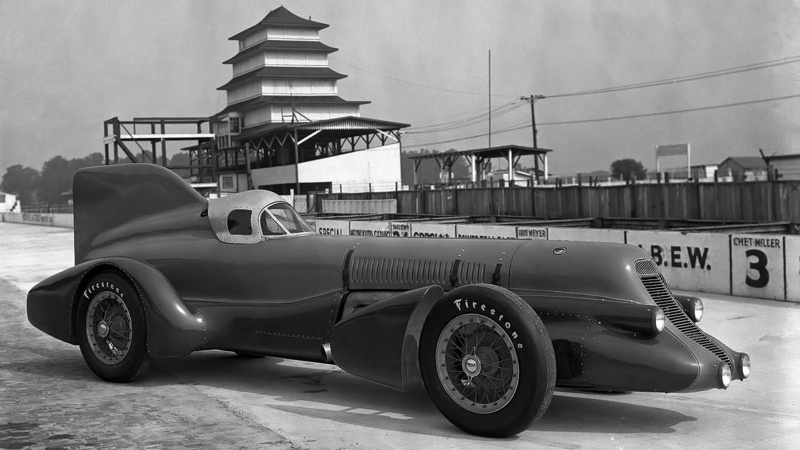 The newly completed Mormon Meteor III at the Indianapolis Motor Speedway in 1938. Note the original exhaust manifold that was later replaced by individual stacks. 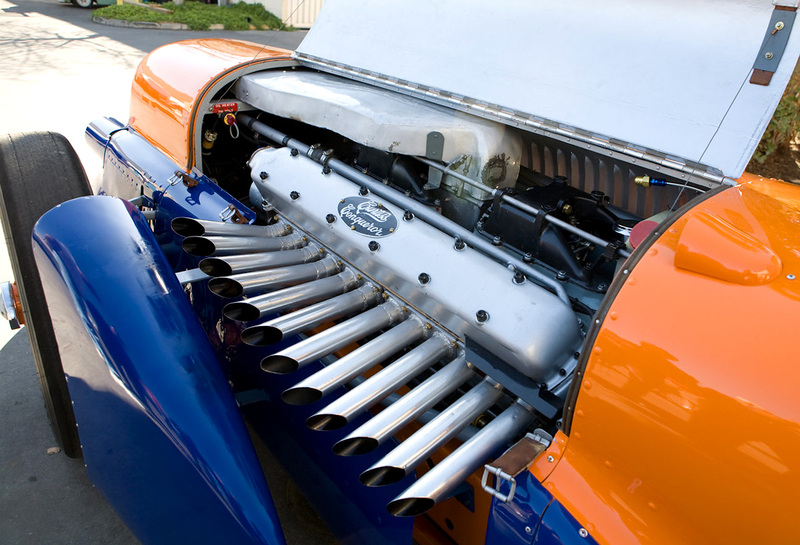 The Mormon Meteor III was built in Augie Duesenberg’s shop in Indianapolis, Indiana. 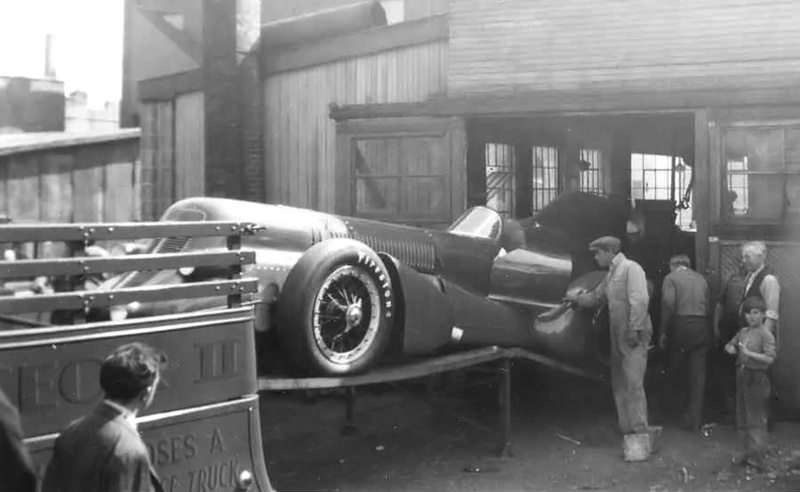 Jenkins wanted the car to be able to accommodate both of his Curtiss Conqueror engines, one powering each axle. However, the initial build would be with just one engine powering the rear axle. The Mormon Meteor III was a large vehicle and designed specifically for endurance record runs. The chassis was offset 6 in (152 mm) to the left on the running gear to aid in the constant turn encountered on the 10 and 12 mi (16 and 19 km) circular record courses. The Mormon Meteor III was an evolution of the Mormon Meteor II. The car was nearly 21 ft (6.4 m) long and had a streamlined, narrow body with an enclosed cockpit. A tall fin was incorporated behind the cockpit, and two fuel tanks were positioned above the rear axle. Power was delivered from the Conqueror engine to the rear wheels via a three-speed transmission. At speed, the 112 gal (424 L) of fuel the Mormon Meteor III carried would be nearly exhausted in around two hours after traveling 400 miles (644 km). Four headlights to provide ample illumination of the track during the night hours were faired into the sloped radiators. The Mormon Meteor III had independent front suspension and specially made Firestone tires mounted on 22 in (.56 m) wheels. The car weighed 4,800 lb (2,177 kg). Marvin Jenkins, Ab’s son, assisted with the build. 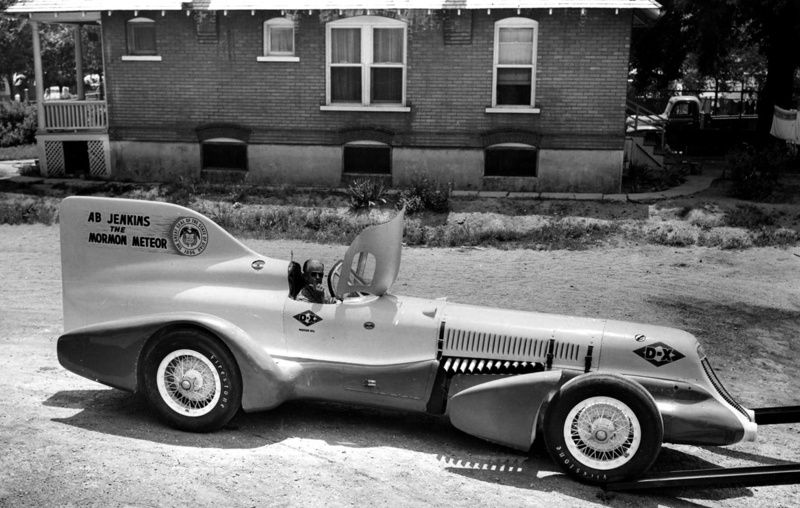 The Mormon Meteor III was finished in 1938 and tested at the Indianapolis Motor Speedway. The car was painted orange and blue: the colors of the Firestone Tire & Rubber Company, its primary sponsor. 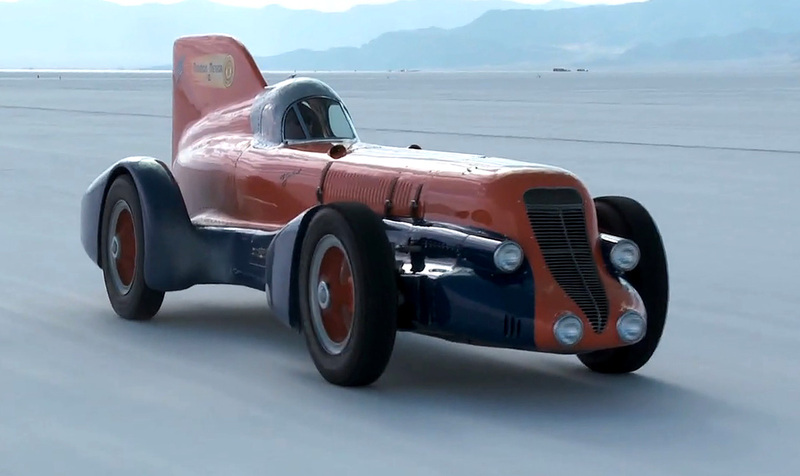 The racer made its debut at the Bonneville Salt Flats in July 1939. The conditions at Bonneville were not the best, but Jenkins and the Mormon Meteor III set a 1,000 km (638 mi) record, averaging 171.30 mph (275.68 km/h). Jenkins intended to run the car longer but a fire changed his plans. The fire started when fuel leaked out of an overfilled tank and came in contact with an overheating universal joint. Marvin had to pry the canopy open in order to free Ab. Jenkins had suffered minor burns and was taken to the hospital. A few weeks later Jenkins was back and, with relief driver Rex Mays, set a 12 hour record covering some 2,040 mi (3,283 km) at 169.99 mph (273.57 km/h). Racing was halted due to a cracked exhaust manifold that allowed fumes to enter the cockpit. The Mormon Meteor III was back on the Bonneville Salt Flats in August 1940. Marvin Jenkins was too young to race the car, but he was able to extensively test the Mormon Meteor III to make sure all was in order. Marvin drove the car for over 2,000 mi (3,200 km) in the course of his testing. The Mormon Meteor III’s narrow body and its 6 in (152 mm) left offset are visible in this image. At 57 years old, Jenkins climbed back in the Mormon Meteor III to again challenge endurance records. With relief driver Cliff Bergere, Jenkins and the Mormon Meteor III set some 21 speed records for just about everything up to 24 hours and 10,000 km (6,214 mi). For the first hour, Jenkins averaged 190.680 mph (306.87 km/h). At six hours, 1,034 mi (1,664 km) had been covered at 172.380 mph (277.419 km/h). After twelve hours, the Mormon Meteor III had covered 2,042 mi (3,286 km) at 170.210 mph (273.927 km/h). After 24 hours, 3,868 miles (6,225 km) had been traveled at 161.180 mph (259.394 km/h). At 5,000 mi (8,047 km), the Mormon Meteor III had averaged 149.420 mph (240.468 km/h). By the 10,000 km (6,214 mi) mark, the speed had dropped to 148.970 mph (239.744 km/h). The Mormon Meteor III did not race in 1941. Jenkins had been elected mayor of Salt Lake City, Utah and was preoccupied with his duties there. World War II then began and put an end to all racing activities. In 1943, Jenkins sold the Mormon Meteor III to the State of Utah for $1.00 on the conditions that he could borrow it for future record runs and that it would be properly cared for. The Mormon Meteor III was put on display in the Capitol building in Salt Lake City. In 1946, after the war, Marvin bought a war-surplus Lockheed P-38 Lightning for $1,250. The intention was to use the two 1,300 hp (969 kW) Allison V-1710 engines from the P-38 in the Mormon Meteor III and make an attempt at the absolute land speed record. However, Briton John Cobb set a new speed record in 1947. 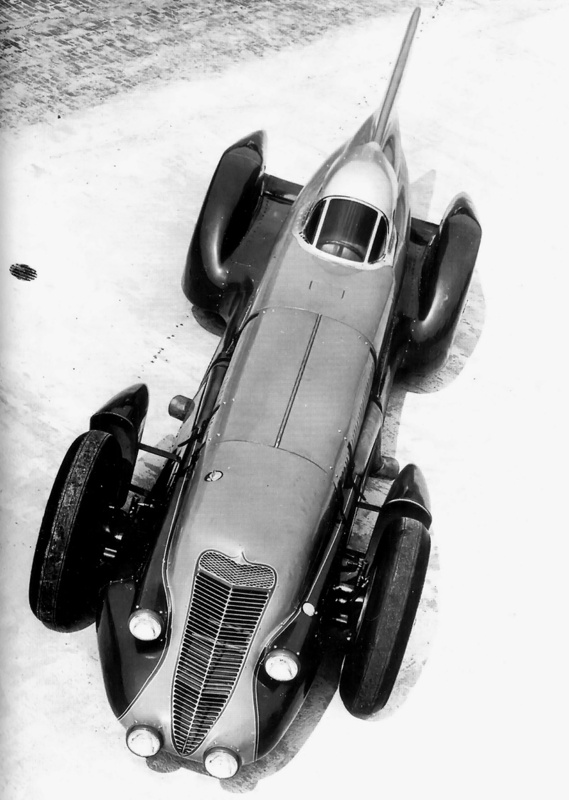 In his twin Napier Lion-powered Railton Mobil Special, Cobb raised the record to 394.196 mph (634.397 km/h). Ab Jenkins felt the Mormon Meteor III would not be able to best that mark even with the two Allisons. 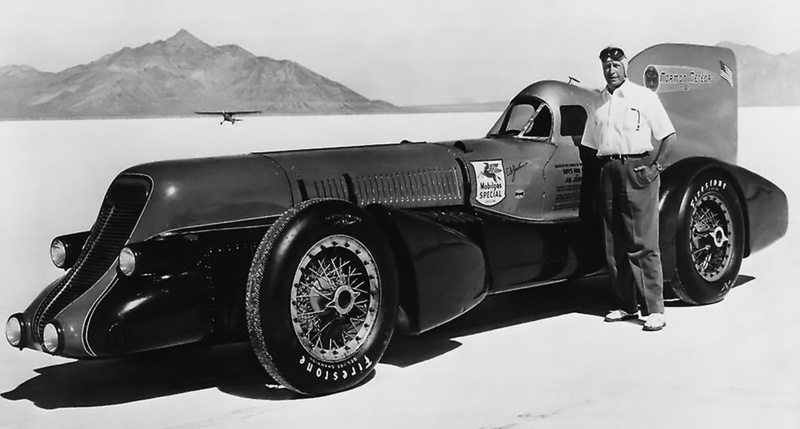 Ab Jenkins and the Mormon Meteor III on the Bonneville Salt Flats. Note the individual exhaust stacks for the Curtiss Conqueror engine. In 1949, Jenkins thoughts returned to racing the Mormon Meteor III. It was taken out of the Capitol and prepped for another run at Bonneville. However, the weather that year did not permit suitable conditions to race, and the Mormon Meteor III was returned to the Capitol. In 1950, the car was again taken out and readied for the Bonneville Salt Flats. In September 1950, Jenkins set off in the Mormon Meteor III. The 67-year-old Jenkins climbed out of the Mormon Meteor III after setting 30 records during the run. His top recorded speed was 199.190 mph (320.565 km/h), and he covered 195.95 mi (315.35 km) in an hour. Jenkins was at it again in 1951, breaking 22 records. For these runs, the Mormon Meteor III was painted light beige and red for its main sponsor, D-X Oil. Jenkins was trying to set a new one hour record averaging over 200 mph (322 km/h) when the clutch locked up. The Mormon Meteor III went out of control and hit a course marker that punctured the car’s radiator, putting an end to the 1951 Bonneville attempt. Ab Jenkins in the Mormon Meteor III in 1951. The car is painted in the colors of D-X Oil, and the top two headlights have been removed for better streamlining. The Mormon Meteor III was returned to the Utah Capitol, where it sat on display for all to see. Jenkins continued to race, and his last records were in 1956 for a 24 hour run in a Pontiac sedan. Pontiac would later name the new car Bonneville in honor of the Salt Flats and all that they inspire. Later in 1956, Ab Jenkins passed away. Over his lifetime, Jenkins had set more records than anyone else and had traveled two million miles (3.2 million km) without getting into an accident or even getting a ticket. The Mormon Meteor III stood proud in the Utah Capitol, but as the years passed, the memory of the car, its records, and the incredible men who made it all possible began to fade. In 1971, the Mormon Meteor III was taken from the Capitol to be used in a parade. Once the parade was over, no one claimed the car and it was left out in the elements. Marvin Jenkins was living in Texas at the time. He received a call from a friend who found the car in a deteriorating state. Marvin immediately flew to Utah. The Mormon Meteor III had been vandalized, and its magnesium components were corroding from exposure to the elements. The car was moved back to the Capitol, and the next 25 years passed with the Jenkins family working with the state government to restore the car. However, some in the Capitol just did not care. In 1996, with the State of Utah having broken the terms of the agreement, Marvin Jenkins took possession of the Mormon Meteor III. The restored Mormon Meteor III back on the Bonneville Salt Flats. Restoration of the Mormon Meteor III continued for several years and the car was returned to working order, but it would not return to the Capitol. The restored Mormon Meteor III, repainted orange and blue, was run on the Bonneville Salt Flats for the filming of Boys of Bonneville, a documentary about Ab and Marvin Jenkins. Marvin Jenkins passed away in 2008, a few weeks before the car returned to the salt. The Mormon Meteor III is currently owned and displayed by the Price Museum of Speed in Salt Lake City, Utah. Ab Jenkins and the Mormon Meteor III still hold about a dozen speed records. 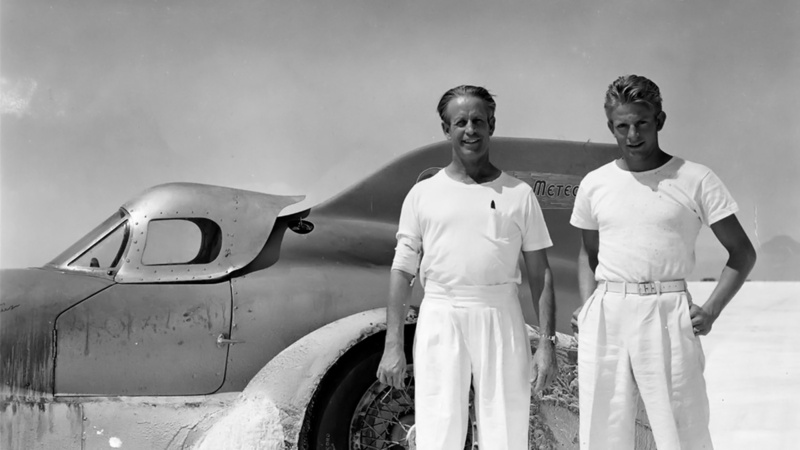 Ab and Marv Jenkins and the hard-run Mormon Meteor III at Bonneville circa 1939. This entry was posted in Automotive on 11 June 2014 by William Pearce. I’m glad you liked my site. Yes, the big Duesenberg inline twelves were made for James Pugh’s Disturber IV before World War I. I had a look at your blog and it looks like you have had a lot of fun with the car and motorcycle crowd. When I was a teenager, my friends and I thought about going on the Power Tour. Maybe someday, but my foot has always been a bit too heavy. Keep up the good work! I absolutely loved this article. I saw the Mormon Meteor several times when it was ensconced in the Utah Capitol Building. It’s a shame it had been left outside to rot. Blasphemy!! I also recall Athol Graham’s attempt to secure the piston powered speed record in his aluminum bodied car. The body was formed much the like the aircraft of the WWII era. Rivets. I think Graham had a 12-cylinder engine in that car. Sadly, he died in his creation at Bonneville. Graham’s shop was located one lot west off the northwesterly corner of 33rd South and Metropolitan Way, Canyon Rim area. It was a small one car cinder block building. I’m not sure if it is still there. As a family, we lived a few blocks away on Metropolitan Way making it easy as a child to pester Mr. Graham while he was trying to work. I’m glad you liked my article, and thank you for your memories of Athol Graham. Yes, Graham’s car has a V-12 Allison V-1710 aircraft engine. It is amazing what dedicated individuals can accomplish in their garages or sheds. Bill it’s still there but as another mecca, the legendary Milosport snowboard shop. Here’s a video on Athol done by one of your old neighbors!